There is greatly increased interest in government and academic circles concerning the prospects for multilateral foreign direct investment (FDI) rules along the lines of a ‘GATT for Investment’. The recently completed Uruguay Round negotiations brought FDI issues within the domain of the General Agreement on Tariffs and Trade (GATT) and its successor the World Trade Organisation (WTO), and in the Organisation for Economic Cooperation and Development (OECD) discussions are continuing on the possibility of a Multilateral Agreement Investment (MAI). The feasibility of further multilateral FDI policy developments clearly depends upon similarities of interests between major actors, and since the European Union (EU) and the USA account for about 70 per cent of the world stock of inward investment (UN-TCMD, 1993), agreement between these two parties will be critical. 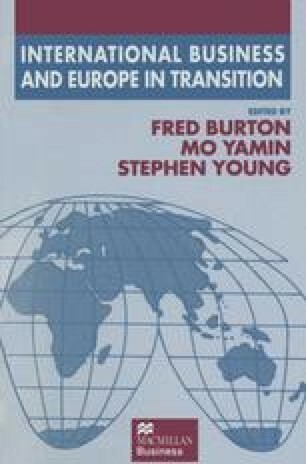 This chapter, therefore, attempts to review and evaluate the results of studies on the impact of FDI into the EU and the USA, as well as comparing and contrasting existing and proposed policies, in an attempt to ascertain the possibilities for policy reconciliation in the longer term.